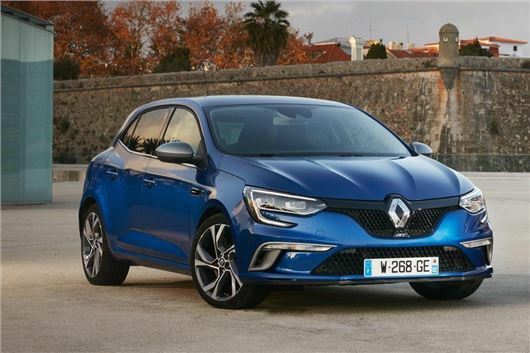 Renault has announced that the new Megane will be available from £16,600, with the order books open now for first deliveries in July. That puts it around £1400 above the starting price of a Vauxhall Astra, but £800 below what you’ll pay for a basic SEAT Leon. With a wide line-up comprising 25 choices, the most you’ll pay for a Megane five-door, before options, is £25,500 for a GT Nav 205 Auto model; the Sport Tourer estate version is due in late 2016. There are six trim levels to choose from, each familiar to other models in Renault showrooms, starting at Expression and rising through Dynamique and Signature before reaching GT Line, with a few ‘S’ and ‘Nav’ models along the way. The engine line-up includes a TCe 130PS petrol and a TCe 205 petrol, while the diesels that will make up the vast majority of sales are a dCi 110 and a dCi 130. All engines come with the option of an EDC twin clutch automatic gearbox, though an auto is the only option with the TCe 205. Claimed fuel efficiency ranges from 76.4mpg and 96g/km in the dCi 110 (74.2mpg and 98g/km with the auto) to 47.1mpg and 134g/km in the 205PS petrol version. A dCi 130 model with a manual gearbox will return an offical 70.6mpg and 104g/km CO2. Renault has already announced that a more powerful diesel with 165PS will appear later, as will a so-called Hybrid Assist version of the 1.5-litre dCi diesel, which uses an electric motor to aid performance and efficiency. The star of the Megane cabin is the new, portrait orientation touchscreen media system, though standard equipment is generous, including low speed automatic braking, lane departure warning, cruise control, Bluetooth, DAB radio, electric windows all around and an electronic parking brake. The range thereafter goes up in the manner you’d expect, with Dynamique Nav adding automatic lights and wipers, traffic sign recognition, a better stereo, dual-zone climate control and, of course, navigation. Dynamique S Nav adds bigger alloy wheels (17-inch rather than the 16s fitted to Dynamique cars), a rear parking camera and the aforementioned 8.7-inch portrait touchscreen – lesser cars make do with a seven inch TFT panel. Signature Nav and GT Line stand side-by-side, offering either a luxurious or more sporty take on French hatchbackery, with the former getting full-LED headlamps, leather seats and a nappa leather steering wheel, and the latter dark metal 18-inch alloys, a sporty body kit and figure hugging chairs. GT models also feature a new four-wheel steer system called 4Control, which turns the front and rear wheels in opposite directions during cornering, for a much sharper steering experience.